Resilinc (http://www.resilinc.com), the world’s leading provider of deep supply chain visibility and resiliency intelligence and advanced analytics, today announced the top 25 most resilient suppliers in the High-Tech Electronics Industry Supply Chain. The companies were identified after an extensive analysis of deep supply chain intelligence gathered over a six-year period, and after a year spent refining the methodology to define, quantify, benchmark and assess the resiliency of a company’s supply chain. “The suppliers named in the Top 25 R Score Companies represent the best-in-breed within their commodity groups. They scored well because of the high degree of transparency they demonstrate in their customer relationships, have a global supply chain footprint that has redundancy built in, have invested in business continuity capabilities that are superior to their industry peers, are rated strong on key performance metrics by their customers and have developed supply chain resiliency programs of various levels of maturity within their organizations,” said Joseph Chacko, the head of the R Score Initiative at Resilinc. 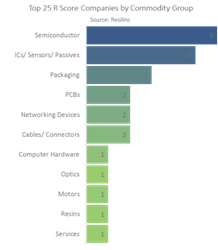 The suppliers in the High-Tech Industry Top 25 R Score list span the following category/commodity groups (refer to image). The Resilinc R Score is the result of six years’ worth of supply chain mapping work which began at Resilinc in 2010. Suppliers in the High-Tech Electronics Industry who are active Resilinc supply chain mapping platform members can receive their R Score and benchmark information for free by contacting Resilinc at http://www.TheRScore.com. To learn more about the Resilinc R Score™, please click here. To download the R ScoreTM Whitepaper, please click here. Disclaimer: Resilinc, R Score™ and Resilinc R Score™ are trademarks of Resilinc Corporation. The methodology is patent pending and calculations are property of Resilinc. All rights reserved.